Life With The Amerman's: Already? I was washing dishes yesterday and Reese walked over to me and said, "poo poo." I asked her if she needed to potty and she nodded her head no. I looked inside her pants and she had just pooped!!!! Do you really think she is already showing early signs of potty training? She is only 16 months! Crazy or lucky, not sure which. But, the sad thing is that I thought I would be so excited to be done with diapers but it kindof makes me sad. Maybe that means we will have to have 3...one day...a long time from now! Mason hides behind our curtains when he poops. After he finishes, he runs out and yells all done. I was tempted to start potty training, but I'm going to wait until after Taylor is born. Are you kidding me! That's awesome. At least she's aware of it. I married my high school sweetheart 7 years ago and we are fulfilling our every dream together. 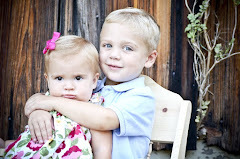 We live in the hill country with 2 healthy and happy kids, Davis (3) and Reese (16 mo). We are forever thankful to God for what He has given us.